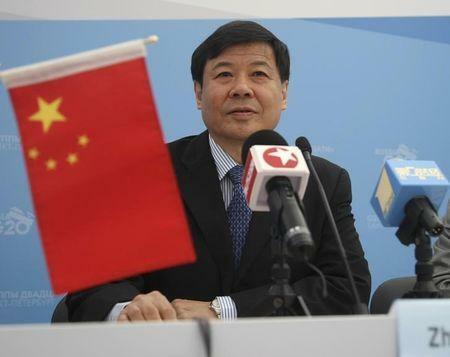 BEIJING (Reuters) - China and the United States will discuss the yuan's value as well as the impact of U.S. monetary policy at a meeting this week, Chinese Vice Finance Minister Zhu Guangyao said on Monday. Top Chinese and U.S. officials, including U.S. Treasury Secretary Jack Lew, will hold their annual talks in Beijing on July 9-10 at a meeting known as the Strategic and Economic Dialogue. "Both sides will conduct candid and deep policy dialogues on the RMB (yuan) issue and issues concerning China's domestic financial reforms," Zhu told reporters at a briefing. China's central bank was seen engineering a drop in the yuan earlier this year in a bid to dampen speculative bets on one-way yuan appreciation. The yuan has been steadying in recent weeks. Chinese officials have long argued that the yuan is near equilibrium after rising nearly one-third since its landmark revaluation in 2005, but the United States remains skeptical, pointing to the China's solid trade surpluses. Zhu said China had urged Washington to pay attention to the possible "spillover effect" of changes in its monetary policy on the world economy, as the Federal Reserve unwinds its quantitative easing. "We hope the monetary policy of the United States, as the largest developed country and main reserve currency issuer, would be responsible," Zhu said. "As the quantitative easing ends and the process of rising interest rates - or monetary policy normalization - starts, we will have candid discussions with the U.S. side on its impact on the U.S. economy, the global economy, including China," he added.